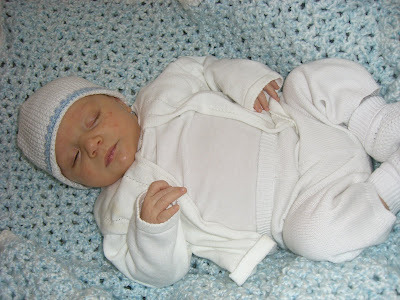 2/3/08- Today Bode was given a name and a blessing. How the spirit filled my home! We woke up early to prepare for the day. Make the food, feed Bode, ect. It was snowing rather hard. Church was at 9, around 8:30, the phone rang, church had been cancelled. To much snow. I cannot think of a better way for my Heavenly Father to tell me that he loves me and is thinking about me then for him to send a huge snow storm- What a tender mercy of the Lord. We lay our hands upon you this baby to give you a name and a blessing. The name that we have chosen is Bode Paulsen Linford. Your Heavenly father loves you very much. Our family loves you. Heavenly Father has saved you for the last day to be and example to your family, friends and others. We bless you with Health and Strength and with a happy life. You are the oldest child to be and example to your parents and to your siblings. We are happy to have you in our home. Follow the spirit. We bless you that you will gain a testimony early in life, you will serve a mission and marry in the temple. We bless you with happiness and with strength to be a leader to others, not just follow others. Thanks for everyone making this an important thing to attend! I love you all, and I love BODE! Bode's name came from a few different places- Cliff and I really liked the name Brody- But Cliff felt strongly that he would call his son Boe- So we basicaly took out the R from Brody and you have Bode. Bode Miller- An incredible skier I cannot think of a better sport to chose a name from. Paulsen is my maiden name. My Dad's middle name is his mom's maiden name, and I would not only like to carry on the tradition, but I cannot think of better people than the Paulsen to name my son after. I look up to my dad so much, he definately is my hero, friend, example, I cannot imagine without his everyday influence. If I can have a son like my dad, there is nothing I would like more. This way he get a little Linford and a little Paulsen. The best of both worlds. Thank you Heavenly Father for not only a son, but a husband and a Dad! !